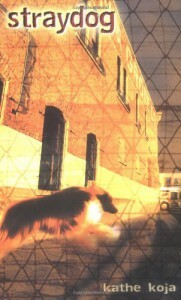 Straydog - Books, Books, Books! Rachel is a Loner in her school. she has no Friends and no one knows that much about her. if there in her Writing Class they know she's a good writer and that's about it. One day that changes, Griffen starts school and is paired up with Rachel in the writing class. Rachel and Griffen become friends over there writing. Griffen goes to the Animal shelter with her were she works to meet Grrl the dog Rachel has been writing about. Now, Grrl is a Wild Feral Collie that Rachel wants to Tame an d Keep. As Rachel Writes about Grrl she see her self a little in the collie. If Rachel can't Tame Grrl then Grrl must go. What will happen if Grrl go's? Will Griffen and Rachel still be friends? Will Rachel Write any more? Will Rachel loose apart of herself. Read and Find out.